Molly stood on a small blanket in a shopping cart. The small pup's tail wagged at near the speed of light as everyone walking by gave her a smile and pat. No one showed worry as they walked by, even though Molly is a pit bull. "Pit bulls, unfortunately, have a bad reputation, but they're so lovable," Pit Bull Crew founder Jeanette Jolly said. The Pit Bull Crew organized a dog wash as one of several fundraising efforts. Started in 2010, the group works to provide pit bulls with basic care and help in finding an adoptive home for the often-stigmatized dogs. "There are too many dog-fighting circles around here," Jolly said. "Many of our pit bulls are bait dogs or are involved in another way." Bait dogs are a terrible part of dog fighting, acting as a punching bag for larger dogs, Jolly explained. The best fighting dogs can be worth $100,000 or more, so the horrific "sport" will likely continue for some time. When a bait dog or other fighting pit bull is found, bite scars and punctures are common. Some are taken to shelters, and the Pit Bull Crew gets involved, helping spay, neuter and provide medical care for the pit bulls and a few other breeds, such as Dobermans and Rottweilers. However, the several youth informational sessions are one of the group's best parts, Jolly said. "We reach out to local community groups and schools to tell kids about dogs— how to safely play with them and straighten some misconceptions about pit bulls," Jolly explained. While there are some fostering of the lovable and better-behaved pit bulls, many are kept at local shelters before joining the crew on outings. 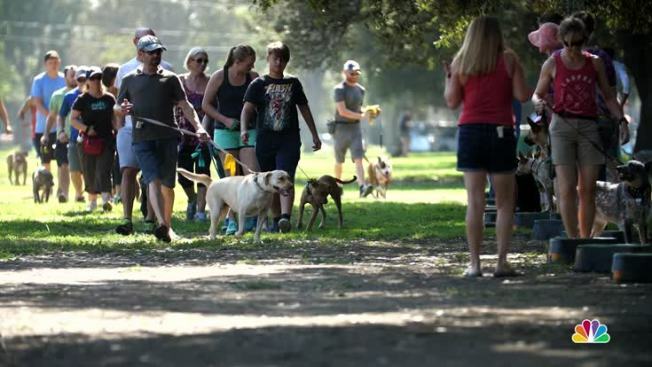 "People love to play with the dogs when we bring them out," Pit Bull Crew President Carey Kendzior said. "Many get adopted right there." Several pit bulls went to the dog wash outside Rural King Supply in Bonita Springs, all happy to see anyone walking by. Several other pups also went to get a fresh scrub, donating to the small charity organization. T-shirts, hats and scarves lined a table to people to purchase. Bill Campos Jr. and his wife, Robin, stopped at the merchandise table inside the store, settling on a scarf and a couple of shirts. The couple adopted a pit bull last year and have embraced the breed. "It's all about their environment," Bill Campos said. "If they have a loving environment with plenty of great human contact, they'll be great dogs. I'm a firm believer that everything deserves a second chance." Their dog Bogey, named after actor Humphrey Bogart, was found wandering the streets at 6 months old. He bounced around shelters until ending with the Campos family and is a lovable and quite excitable dog, Robin Campos said. "When we told our daughter we got a pit bull, she said she was never coming to our house again," Robin Campos said. "When we finally got her and my grandson to come over, we let (Bogey) out of his cage. He charged at the two and started licking them. Now my grandson comes to see our dog instead of us." Volunteers host several events throughout the year, including drives at Bass Pro Shop and Harley-Davidson retailers.